Christian education is at the very heart of the church. In the educational process the Spirit of God encounters people of all ages so that they are nurtured in faith, grow in knowledge and experience, and are inspired and empowered to live as disciples of Jesus Christ. This call to discipleship compels us to share our faith and serve others in the home, the community, and in God’s world. Whether you are looking for an Adult bible class, Sunday School for youth, or information on baptism and confirmation, Divinity Lutheran Church has something for everyone. A child’s journey in faith begins with his/her baptism. Before the baptism occurs, parents will meet with Pastor Doug. 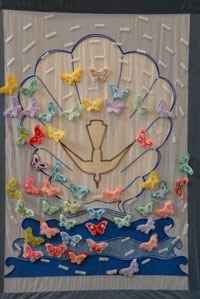 On the day of your child’s baptism, a personalized butterfly will be given to you to be placed on the church banner commemorating the special day. (This butterfly will be sent to your child when he/she turns 3, as he/she begins his/her 1st step in attending Sunday School with friends). For our youngest believers, there is Baby & Me. It is a class offered to parents with infants and toddlers through age two. Parents and children stay together. It meets in the nursery. At age 3, your child takes his/her 1st step by attending Sunday School with friends. It meets in the Room 13. Your child reaches another stepping stone as the Holy Scriptures are placed into his/her hands in the 2nd grade. During the 4th grade, your child will reach another stepping stone by preparing for and receiving his/her 1st Communion. The start of 7th grade marks the beginning of our Confirmation Program. It ends with the youth confirming their faith in the spring of their 8th grade year. They meet on Sunday Mornings, as well as, Wednesday evenings from 7:00-8:15. Senior High Sunday School. This group meets on Sundays. They spend their time discussing how life events/challenges relate to what it means to be a Christian in the world today. Our young adults who have graduated high school are invited to join the adult education programs offered.